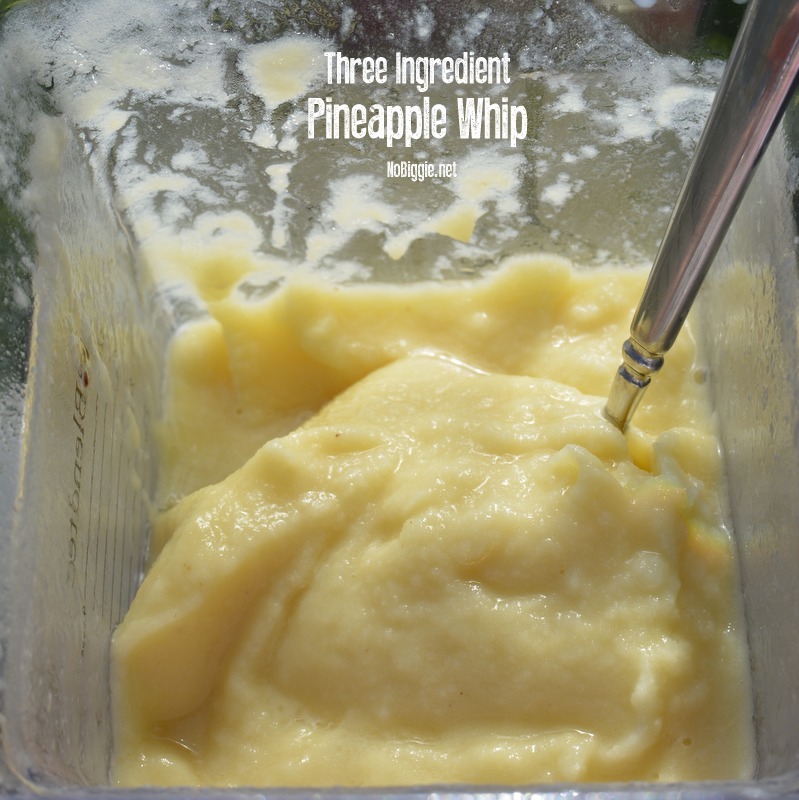 This 3 ingredient pineapple whip…(you know the kind you wait in line for at DisneyLand) is super easy to make at home. A few places near our home sell a pinapple whip, but they make it from a powdered mix, and the list of ingredients is a mouthful. You know what they say…if you can’t pronounce it, then you shouldn’t eat it. That’s why this recipe is awesome…just 3 simple ingredients and you can have a healthy frozen drink in no time. I think you need a frosty cold drink in your hand stat! 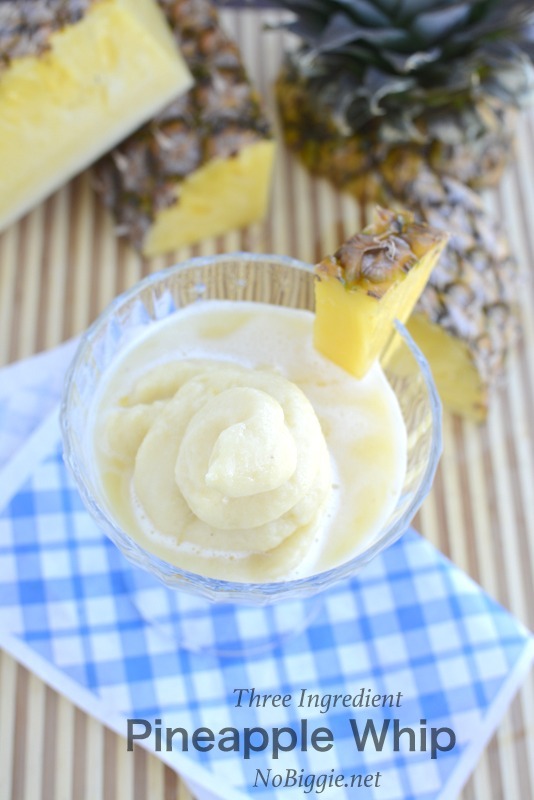 Plus this pineapple whip is gluten free and dairy free. For a while we were on an elimination diet, and I was thrilled to learn that I could make this for a healthy cold treat as an alternative to ice cream. Ready for the easy recipe? You’ll need a good blender for this…we love our Blendtec Blender. It’s the best! 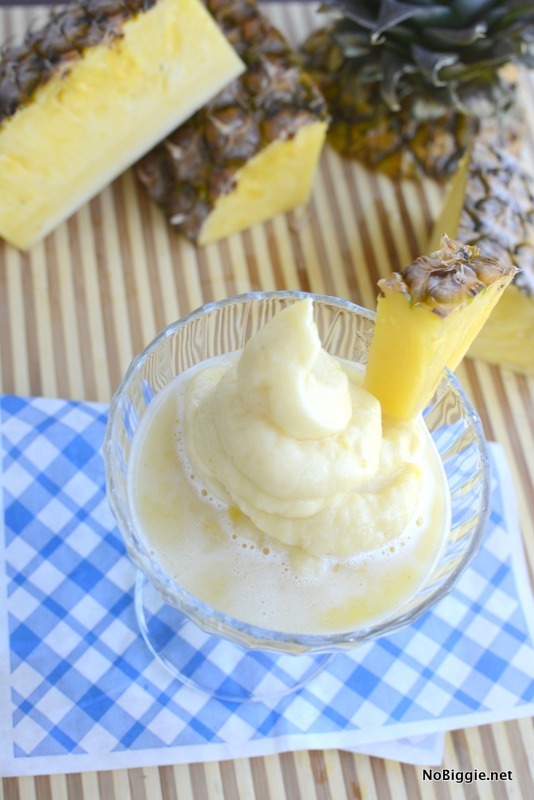 Easy Pineapple Whip float made with just three ingredients! Peel and chop up one fresh pineapple, and freeze it in chunks. 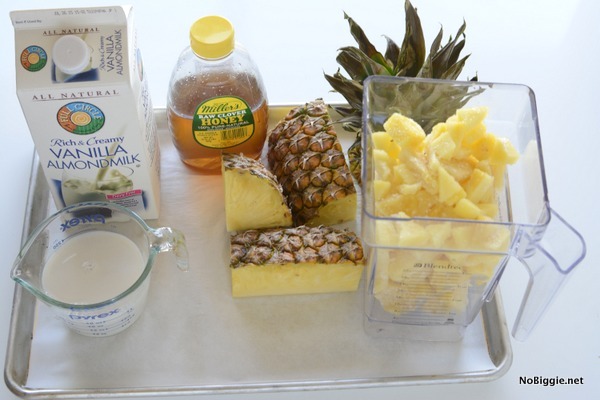 Once frozen, blend the pineapple chunks, almond milk and honey together. Add extra almond milk as needed to assist your blender along the way. Blend until smooth and serve. For that classic pineapple whip soft serve swirl look, pour the mixture into a small plastic baggie and snip off a corner of the bag and squeeze the pineapple whip out into your glass. Garnish with a little fresh pineapple wedge to the rim of the glass for fun. 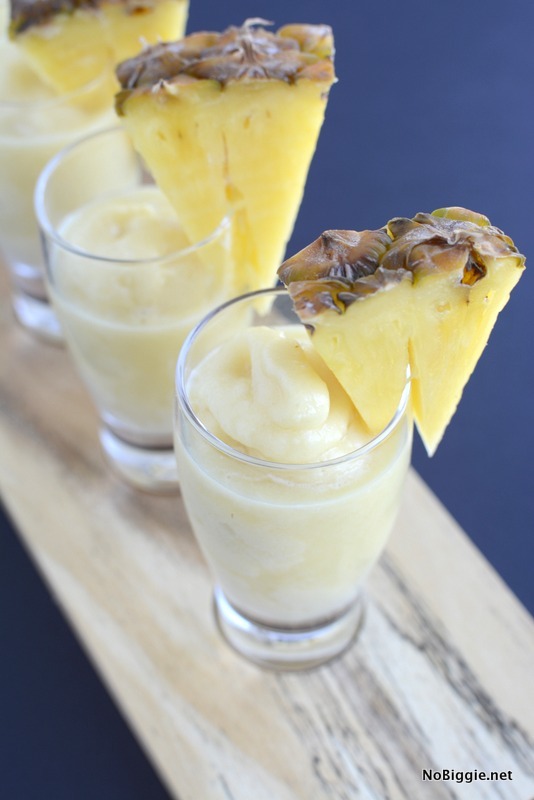 As your drink melts a little in the glass...your pineapple whip will become a pineapple whip float! It's so good! We are big fans of our Blendtec Blender. You'll want a good blender for this recipe. Did you know that once frozen, the tough fibers of a pineapple core will change as they freeze making the core just as edible as the rest of the pineapple? Plus you'll be blending it all, so next time don't throw out the core...just blend it. Now that we have our frosty pineapple whip, we need a festive drink stirrer…don’t you think?! 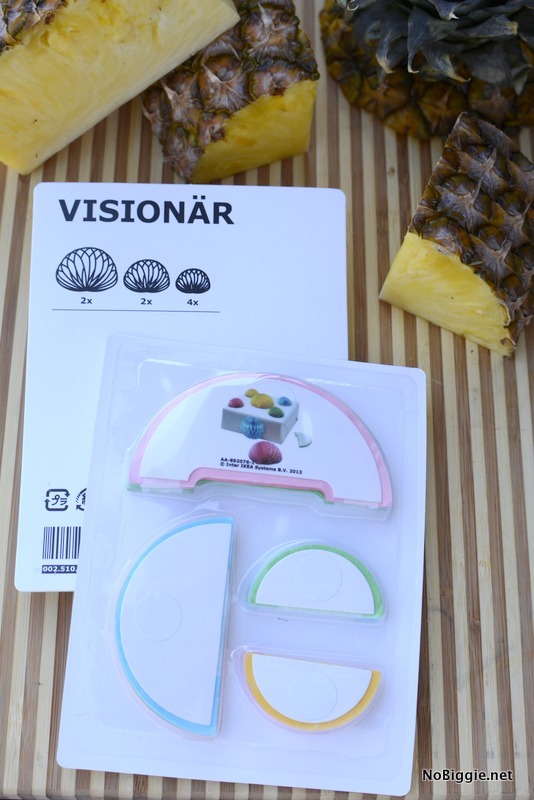 Have you seen the paper party supplies at Ikea? They have these little honeycomb gift toppers that are pretty darn cute. Stick three of the smallest yellow half circles together (you’ll need to buy three packages to get three of the same size) and a small piece of green paper to make a pointy pineapple topper. 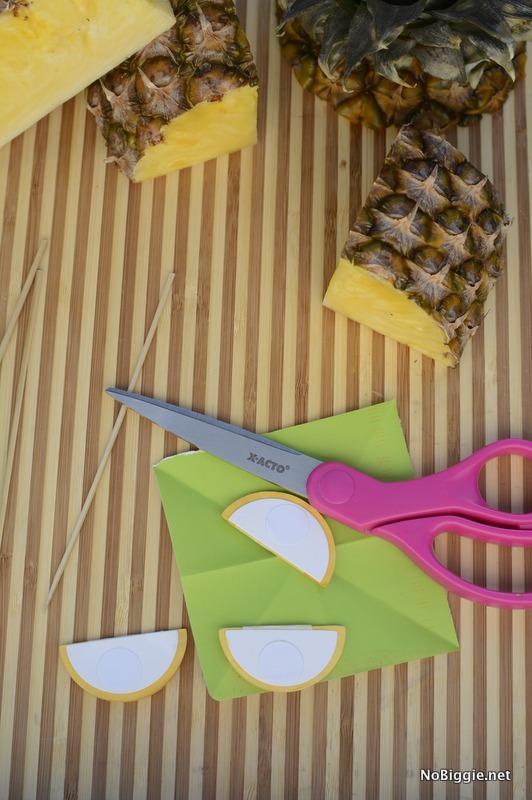 With regular scissors, cut the green paper to look like a pineapple stem. Stick in a wooden skewer and you have a cute little pineapple drink stirrer perfect for your pineapple whip! With or without the drink stirrer, this frozen drink is a must on a hot day. -Peel and chop up one fresh pineapple, and freeze it in chunks. 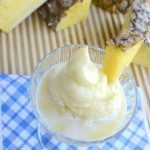 -For that classic pineapple whip soft serve swirl look, pour the mixture into a small plastic baggie and snip off a corner of the bag and squeeze the pineapple whip out into your glass. -Garnish with a little fresh pineapple wedge to the rim of the glass for fun. 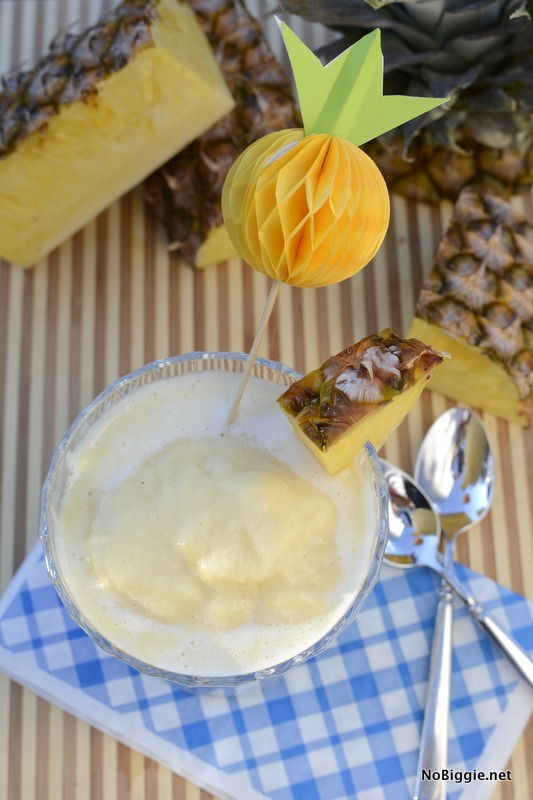 As your drink melts a little in the glass…your pineapple whip will become a pineapple whip float! It’s so good!